With advances in technology and more advanced manufacturing techniques, ergonomic sculpting, exotic shapes, and highly technical mechanisms have seemed to become a mainstay of many of today’s manufacturers and Gerber is no exception to this as evidenced by the creation of the Flik multi-tool previously reviewed here at TPF-Online. Gerber has been around for quite a number of years and has made countless designs of knives, multi-tools, and other products which are used by a great many people around the world. However they realized that as technology advances, there is still a very basic principle which needed to be heeded. What is the basic definition of a knife? A tool used for cutting. That was the entire concept behind the knife being reviewed today. The Basic, a fixed blade knife by Gerber was designed and began production several years ago. As stated, it was a throwback in design with the primary factors being size, generic functionality and durability. The Basic is just that, a very basic everyday utility knife. Featuring a 76.2mm (3.0″) drop point blade design, the blade is very typical for many knives and follows a sabre ground profile for strength. The cutting edge is partially serrated for true multi-purpose design utility. With the spine/full tang measuring 3.8mm (0.150″) in thickness, the robustness of the design is very apparent. While the overall knife length of 168mm (6.6″) makes the handle small, the huge large finger groove/choil behind the blade edge allows for a very secure grip. Due to this large choil it almost appears that the small grip panels were added as an afterthought to the full tang of the Basic. TPF has noticed however that the blade length has been listed at various sites, including Gerber’s, as nearly 86.5mm (3.40″) in length which would be measuring from blade tip to the leading edge of the grip panels. The grip panels themselves are not spectacular, primarily being made of nylon, and each side is secured into the full tang by three small Torx head screws. However a large portion of these nylon panels mount Gerber’s TacHide™ grip material which is very soft and provides a very secure grip on the knife. The full length tang incorporates a trio of scalloped indents on the spine as thumb ridges, in addition to the large lanyard loop incorporated in the full tang and accentuated by the grip panels. TPF was unable to determine the mechanical properties of the steel used to manufacture the Basic, but a source says that the blade is most likely constructed with 420HC stainless steel, which is nearly a default for Gerber products unless otherwise indicated. The entire blade and tang are nitride coated for additional corrosion resistance and results in a generally matte dark grey finish. Overall knife mass is roughly 105 gr (3.7oz) which is considerable when combined with the very small size of the knife itself. It seems to be a success when measured against the basic design principles used for it’s creation. However, TPF will note that the handle profile, while designed for extreme comfort and great control, is somewhat diminutive for those individuals whom have larger hands as the knife becomes a three finger profile. The sheath of the Basic is the complete opposite of the knife in terms of simple design criteria. Created from two molded halves mated together, the completely polymer sheath is a marvel of modern design. A plastic tension catch is part of the molded sheath and securely retains the Basic knife with a force that would potentially overcome the reversible metallic belt clip. The clip is positioned for right handed carry and is made of a stainless spring steel. Retained by two small screws similar to that of the belt clip, a small metallic plaque is on the opposite side of the sheath proudly displaying the Gerber name. TPF did not try to reverse the clip as the durability of the sheath is most likely the weakest point of this entire package. Combined the Basic knife and sheath measure only slightly longer than the knife itself at 173mm (6.8″) and the small package, while fairly heavy is indeed a worthy addition to nearly person’s knife inventory. The large finger groove, TacHide grip and thumb scallops made the Basic very easy to handle. 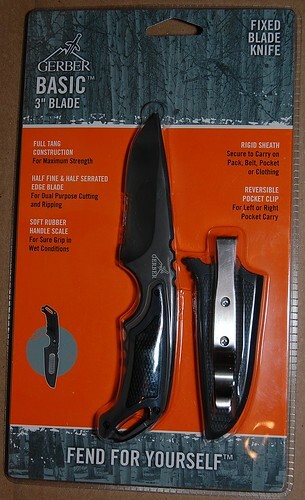 The Basic knife as offered by Gerber Gear, is a fixed, partially serrated blade which has an MSRP of 43.00USD, and is available at many outdoor supply stores as well as online retailers such as www.canadiansafetysource.ca. 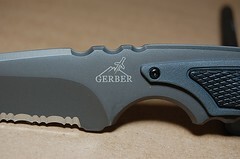 As usual however, it is up to you the reader to decide if the Gerber Basic is Practical, Tactical, or Fantastical. This entry was posted on May 9, 2012 by M. Duynhoven. It was filed under Blades and tools and was tagged with Basic, blade, fixed, Gerber, knife, TacHide, TPF, TPF-Online.